After John Stephens (aka Stevens) purchased the Black Eagle from Albert Franz Christian Weidt in May 1877 he soon after changed the name of his establishment to the Greyhound. We saw that the name of the Black Eagle reflected the Prussian background of Weidt, but what can we say about the Greyhound? Stevens was born in the tiny farming village of Aylburton, Gloucestershire in 1825, and baptised just a short 2.5 kilometre walk away in the larger village of Lydney. Here in Lydney a Greyhound Hotel still exists. It seems likely that Stevens named his hotel after a favourite old watering hole. He next appears in the public record in May 1877 when he purchased the Black Eagle. In April 1878 Stevens married Harriet Ann (nee Moore) at Holy Trinity Church. As colourful as Stevens already was, his wife was to become the more notorious of the two. When John and Harriet married, John was was 57 years old and claimed to be a bachelor. Harriet was 37 and a widow with three living children. But Harriet’s story was much more complex than her marriage registration revealed. Later she admitted to three previous marriages before John. Harriet had legally married George Hobbs in Wiltshire in 1851 then claimed to have married a William Herd (bigamously), in Adelaide, then John Coutie in Wangaratta in September 1874. She had separated from Hobbs, who lived on until 1902, Herd had died in 1870, and Coutie had also conveniently died in 1877, leaving a large leasehold of land which Harriet claimed as his ‘widow’. At various times Harriet also used the christian name Ann, and any combination of her maiden and married names. As a result of the ambiguity about her relationships, who the father of her two youngest children was, is a matter of conjecture. Stevens and Harriet separated not long after their marriage, in a flurry of accusations of violence by both parties, and Harriet was later successful in having an order for maintenance made against her husband. In 1886 Harriet became infamous when charged with the murder of North Wangaratta farmer, and father of her son-in-law, John Plum. How she escaped the noose is a story for another post. It seems unfathomable how Stevens was granted a license for any hotel given his history, and true to form, he carried on the management of the Greyhound, with constant aggravation to authorities. When he appeared before the Licensing Court in December 1883 for renewal of his publican’s license, Sergeant Arthur Steele opposed the application. ...on the grounds that the applicant was of drunken habits, and allowing persons of bad fame to harbor in his house. He had seen the applicant frequently intoxicated, and using blasphemous expressions. Women of known immoral character had lodged in his house. In reply to Mr Norton, Sergeant Steele said he had heard, disturbances at the house on several occasions, and had heard Stephens use filthy and obscene language. Was obliged to arrest him in his licensed house, for drunkenness and assault. Opposed the granting of the license two years ago. Would have opposed the granting of it last year, but he (witness) was absent from home. Constable McHugh also gave evidence, and stated it was a house where women of bad fame received accommodation. Mr Norton said the police had a ” dreadful down” on his client. George Edmondsen [sic] and Robert Menzies gave evidence to the effect that they had never seen anything very bad about the Greyhound Hotel, although they lived a short distance from it. They also gave Stephens a pretty good character. After some consultation, the Bench said that the withdrawal of the license would involve a large pecuniary loss. They would, therefore, grant the license, on the condition that the applicant for the future conducts his house in a respectable manner, and cautioned him to do so, else his license would be cancelled. has been a source of great trouble and annoyance to the police. The people who frequented the place were, mostly vagrants. This time last year the licensee was warned that if he did not conduct his house better, the license would be forfeited. 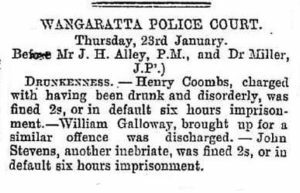 … Constable Dainty deposed : Know the licensee and situation of the Greyhound Hotel ; it is not in a populous locality; have arrested people from the hotel during the last 12 months; have seen Stevens drunk, and have reported the matter to the superintendent of police ; saw him drunk in his own house on the 24th August last; his housekeeper brought me to the place; he is a man who cannot converse without using bad language; he had a woman named Maria Osborne about his place ; she is a prostitute ; his housekeepers were generally of the vagrant stamp ; a man named George Middleton lived there; he is a person who lives on the earnings of low women. By Mr Norton : Stevens has been licensee of the hotel during the last 5 years, to my knowledge; have only brought Stevens up once during that time, but have cautioned him very often ; have been called to his place by his housekeepers several times ; have had occasion to go to his house three times during the last twelve months ; have seen bad characters at the place; have seen Maria Osborne drunk there. Sergeant Steele deposed : Know John Stevens and his hotel ; have often had occasion to go to his place, and have been attracted there by hearing bad language; nearly all the women he had had have been in gaol; bad characters frequent the place; have opposed his license twice before; Stevens has been before this court; maintain he is not a fit person to hold a license ; the place has been a source of annoyance to us ; think his neighbors would be frightened to give evidence against him, as to the manner in which he conducted his hotel. Mr Notcutt said, with the permission of the Bench, he would put in another witness. Constable O’Sullivan was then called, and corroborated the evidence already given. Respected businessman and Justice of the Peace Alexander Tone then strangely gave evidence on behalf of Stevens. “Know the Greyhound Hotel ; have known Stevens for about 15 or 16 years ; know nothing about his hotel ; there has been no objection to his license, to my knowledge. … Have no idea how the house is conducted ; find Stevens as a businessman very correct.” The Bench said that sufficient evidence had been brought forward to prove that the house was not properly conducted ; therefore the license would be refused. Mr Norton asked that the court be adjourned, so as to allow of another person taking the hotel. The Bench refused the application, and the court closed. So that was the ignominous end of the Greyhound Hotel. 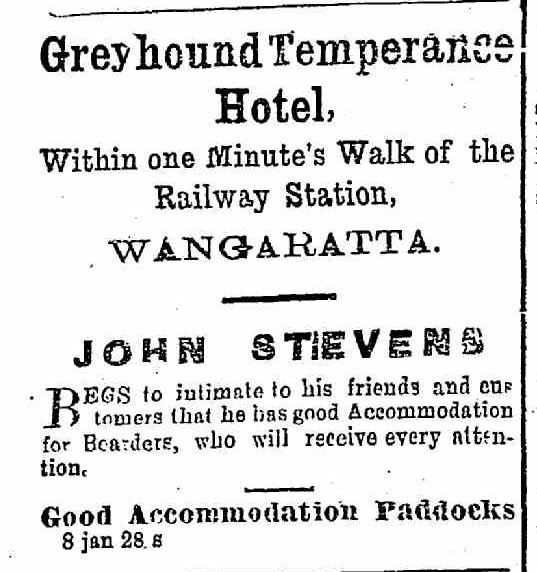 Undeterred by the lack of a license to serve alcoholic beverages, Stevens reinvented his establishment, laughably, as the ‘Greyhound Temperance Hotel’ in January 1888. In January 1890 he was advertising for a housekeeper for the Greyhound. Stevens’ death a few months later brought finality to the saga of the Greyhound, and in some ways explained his unwillingness to clean up his act and maintain the hotel license. Stevens died from kidney disease, and while the attending physician claimed he had suffered for only one month, it was most likely that the disease was chronic and the doctor was merely referring to the acute stage. William Howell, who had owned the Royal Oak (on the corner of Grey and Rowan) until at least mid 1889 while other people were licensees, applied for a wine license for the Greyhound premises in December 1890 but that venture doesn’t seem to have been successful. So the history of the Greyhound Hotel seems fairly wrapped up except for one major point. Where exactly was the Greyhound? The location of the Greyhound has long been a point of uninformed guessing and just plain misinformation. In the end, my hunch was proven by reading John Stevens’ probate documents, matching up descriptions of the premises, reading allotment numbers of his property on maps, careful following of changing street names, and late nights reading licensing court records. Let me explain. Map showing Grey Street running vertically from Templeton to Roy Streets, 1855, National Library of Australia. When Albert Weidt first applied for a license for the Greyhound’s predecessor, the Black Eagle, in March 1875 his premises was described as consisting of eight rooms, plus stables. This was not a normal sized residential house. It was sizeable enough to accommodate the owner, his family and have several (maybe four or five) rooms for the use of hotel residents and guests, and we shall come back to this description. The location of the premises has also been confused by differing newspaper reports on the street it was in. 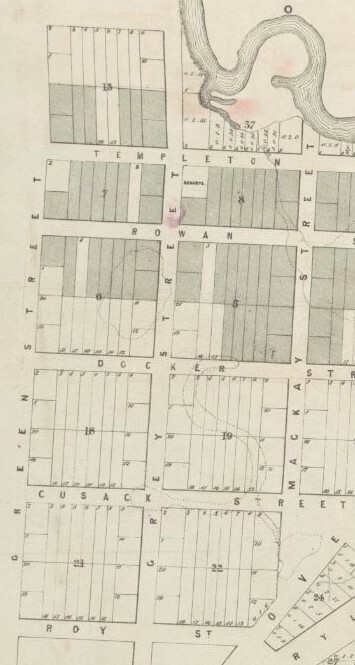 Before the railway line cut through Section 21 (and other Sections) of the township of Wangaratta in the early 1870s, the streets had different beginnings and/or endings. In March 1875 Weidt’s Black Eagle was said to be in Grey Street, and later Steven’s Greyhound also in Grey Street, yet licensing records in December 1881 record the hotel in Norton Street and in 1884 the Ovens & Murray Advertiser reported it in Cusack Street. In fact the Black Eagle and the Greyhound never moved. 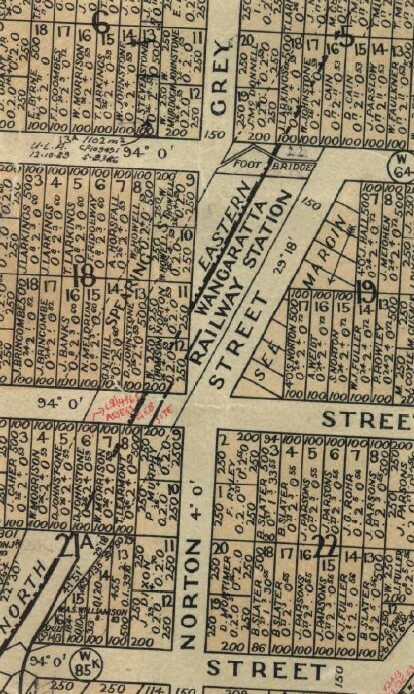 Before the railway line created havoc in Section 21, Grey Street ran all the way from Templeton Street to Roy Street, and most likely to Ryley Street. [See the map on the right]. Plans for the railway began in the 1860s and after the railway was finally opened in 1873 the southern section of Grey Street was re-named Norton Street, though locals, and even the licensing court took a while to get used to the new names. [See map below, left]. But what of the Cusack Street reference? This was probably an error, but understandable as we shall soon see. The final piece to the puzzle was very easy. Confirming my suspicions, a death notice for John Stevens noted his death occurred in his Norton Street residence. His probate documents described his Wangaratta township property (there were several other other property parcels) as being on “Allots. 11 and 12 of Sec. 21 in Norton Street, Parish of North Wangaratta, with an 8 roomed brick dwelling, and a brick stable”, valued at £450. 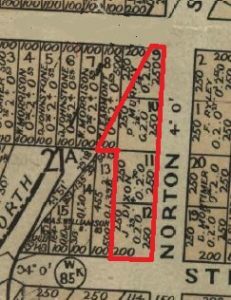 Also “Parts of Allotments 8, 9 and 10 of Section 21, in Norton Street, Parish of North Wangaratta”, valued at £150. This fits in perfectly with the advertisement [above] for the Greyhound Temperance Hotel as being “within one minute’s walk of the railway station”, with the changing street names of the hotel location, and even with the Cusack Street reference. It is clear that the building itself was located on allotment 11 or 12, or perhaps straddled both allotments, but the entire property extended from Roy Street to the corner of Cusack Street. Below is the outline of the land of the Greyhound Hotel, after the railway line cut through the blocks. Outline of allotments 11, 12 & part of 8,9 & 10 in Section 21. 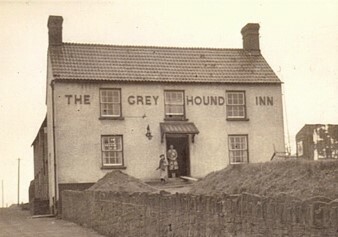 The Greyhound Hotel was located on lot 11 and/or 12.